Shown here in Cream Smooth, think of lying back enjoying a creamy ice-cream cone. 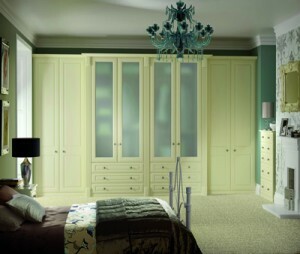 Look at the colour and imagine you are relaxing in our restful Cream Smooth finish bedroom. Accessorise with a plethora of cushions, blinds and drapes in a series of bold hues. This bedroom is available in all the fabulous colours and finishes you see below. You can view all these finishes in the comfort of your own home. We’ll bring samples of each of them with us to your free, no obligation planning and design visit. The Glendale Range - Click Door For More Detail.